The 2 Sisters chicken abbatoir, slaughter house and food processing plant at Flixton Bungay, Suffolk. Photograph: Sean Smith for the GuardianQuietly, almost unnoticed, something unusual has been going on inside the UK’s industrial chicken sheds. They have been signing up to rights – not the animal rights of TV agitations, but worker rights. Ninety percent of them are now covered by collective bargaining agreements. In an industry characterised by casual foreign labour, in the middle of a recession, the union movement is resurgent. Five years ago it was weak and declining, its historic base in this manufacturing sector eviscerated by the thrust of corporate globalisation. It is a shift in the balance of power between capital and labour that is likely to be played out in full after the election when the battle for the heart of the Labour party breaks out again. Jack Dromey, deputy general secretary of Unite, has been one of the driving forces behind the unionisation of chicken factories. A member of the Labour party’s national executive committee, and married to deputy leader Harriet Harman, Dromey will this election achieve his long-held ambition of standing for a strong Labour seat. Cheap factory chicken is one of the defining commodities of our era. The poultry parts that have been churned out by production lines for mass consumption since the late 1980s are the sugar, tea and opium of the age. Migrations have been needed to produce them. The buzz phrases are new – vertically integrated production, subcontracted labour, light-touch regulation – but supermarket chicken encapsulates today’s political and economic realities just as those other battleground commodities did in previous centuries. That’s why not one but two celebrity chefs have ended up making TV programmes about chicken (celebrities being another defining commodity of the day). It’s also why the renaissance of unions in the poultry industry is likely to go down as a pivotal moment in the history of the labour movement. A report from the Equality and Human Rights Commission in March highlighted why the fight for a new settlement for both British and migrant workers is likely to intensify. 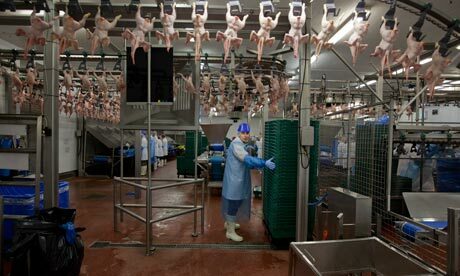 Its statutory inquiry found widespread abuse of agency workers, most of them migrants, in the UK meat sector, including breaches of the law and basic human rights. It also concluded that practices were fuelling racial tensions and could be discriminatory since they indirectly blocked British workers from jobs. It was concerned too that the abuses and tensions were not confined to the meat sector but likely to apply to all sectors using low-paid migrants, from construction to cleaning, catering and social care. The unions began laying their groundwork for this political battle five years ago. In June 2005, leaders at the Transport and General Workers’ Union decided to make the poultry sector the focus of a new strategy for a post-Thatcher world. The supermarket chicken chain was becoming increasingly casualised, with agency work, most of it done by migrants on poorer pay and conditions than locals, taking the place of real jobs, creating serious racial tensions in factories and distribution centres and the communities around them. The Warwick agreement between Labour party and unions in 2004 to promote “fairness at work” once the 2005 election was in the bag helped keep toxic immigration debates off the campaign agenda but, post-victory, the pledges to remove some of the curbs on union powers and give equal rights to temporary workers were looking worryingly vague. So the T&G decided to organise, not just factory by factory, not even just globalised company by globalised company, but whole sector by whole sector. The highly concentrated nature of the chicken industry, with just three companies accounting for the lion’s share of UK production, made it an ideal starting point. And they decided to take the campaign not just to the factory employers but, in the brave new world of indirect employment and outsourcing, to the employer’s clients, the supermarkets. Publicly embarrassing the companies at the top of the chain, which preferred to shift responsibility down the line to their suppliers, was identified as a vital new tool. They were not faceless employers hidden in remote business parks but high-street names with brands to protect. The T&G, later to become part of Unite, the superunion born from a merger with Amicus, began by establishing a new central organising structure. Seventy national organisers, ranging from Glaswegian shop stewards to Polish solidarity supporters and professional US union promoters were recruited to target the poultry industry up and down the country. A third of them were from ethnic minorities, a third were women, and their average age today is nearly 20 years younger than the typical union profile when the campaign began. Invigorated by the energy of migrants from the former Soviet bloc brought up on expressing political dissent through collective action, the labour movement was being rebuilt from the grassroots up. The landscape of post-Thatcher industrial relations was beginning to change. The first opportunity to test the strategy of embarrassing supermarkets came that summer. In Herefordshire a group of Polish and other eastern European workers on one of the UK’s largest strawberry farms supplying the main supermarkets walked out in protest at conditions. In the first agricultural workers’ strike since the 1920s, they sat down in the main road to Leominster and refused to move. The T&G took up their cause. Initially the retailers batted back union requests for action on the ground that they were not the employers. With flying pickets outlawed, the union instead staged a series of “flying protests” outside 17 key supermarket stores, telling customers how their strawberries were produced. The supermarkets agreed to talk. Over the months that followed the focus returned to the poultry sector, and through 2006 and into 2007 a series of tripartite negotiations took place under the auspices of the Ethical Trading Initiative, an alliance between the union, the big chicken processors and, crucially, those holding the real pursestrings, the supermarkets, trying to get agreement on the scale of the problem and how to tackle it. With its new organisers on the ground, the union was finding chicken factories being run with 40-50% of their workers coming semi-permanently from agencies, most of them migrants being paid less than locals, with stories of physical and verbal abuse and outbreaks of tension between nationalities common, the latter sometimes spilling over into physical fights. The industry and retailers disagreed but everyone accepted that in a market where prices have been driven down by buying power it was impossible for one player to change conditions on its own – if its prices went up to reflect the increased costs, it would simply be undercut by rivals. They reached an impasse. So for three years since it has been back to the flying protests – outside stores, at supermarket shareholders’ meetings – and steadily organising, gathering evidence. Armed with its reports from members around the country, Unite submitted its evidence to the Equality and Human Rights Commission, resulting in the statutory inquiry. Shortly before the publication of the EHRC report, Asda announced that it had reached agreement with Unite to make all its UK meat suppliers comply with minimum labour standards, including equal pay for agency and permanent workers. Marks & Spencer invited the Guardian to visit the factory in Flixton, Suffolk, where its brand of high-welfare Oakham chickens are processed. The plant is currently owned by the 2 Sisters Food Group, one of the leading supermarket suppliers, which slaughters, cuts and packs around 3m birds a week and controls about 20% of the UK poultry market. M&S was one of the supermarkets targeted with flying protests by Unite, and like its rivals has been the subject of critical press reports about labour conditions in its supply chain. Its own ethical audits had revealed some disturbing problems. Its response was to pilot the idea of “ethical model factories”, not just in developing countries but also in the UK, as part of its Plan A programme. Launched in 2007, Plan A aims to make the whole M&S supply chain sustainable both environmentally and ethically. 2 Sisters was set up in 1993 by a Birmingham-based entrepreneur, Ranjit Singh. By his own admission it had grown into one of the biggest operators in the UK by being the undercutter of the industry. If they could crack the problems here, M&S said they felt they could extend the lessons elsewhere. An independent audit in 2006 revealed the scale of the challenge. It told M&S of an “oppressive culture” and a “climate of fear” at the Flixton factory, with two to three accidents a week, some of them, according to workers, going unreported. Workers complained of not knowing when the production lines would stop and of being forced to work overtime late at night without warning or sometimes for whole weeks at a time without days off. They said managers shouted and bullied people. Communication between the 15 and more nationalities on the factory floor and managers was so poor that managers passed on their displeasure at one supermarket technical audit by simply holding up a red card to workers. Singh also admits that he was deeply cynical about the M&S model factory pilot at the outset. Suppliers are used to having to jump to supermarkets’ orders which come and go in rapid succession, he explained, so he told his staff to play along with it but make sure they didn’t spend any money on it. He now describes the experience as a “painful journey” but with the surprise bonus that it’s good for business and the bottom line. The M&S plan has required him to cut energy and water use and waste, saving money, and to confront the working culture. The numbers of agency staff, which had reached 55% at times, have been cut, with many migrants offered permanent jobs and training and more promoted to supervisory roles. Bullying managers have been disciplined or asked to leave. The result has been a dramatic fall in staff turnover and increased productivity. The ride is still bumpy on all sides. Unite withdrew from the M&S model factory project when a dispute broke out at a separate 2 Sisters factory in Birmingham, that supplies other supermarkets, over alleged racist abuse. Equal pay for permanent and agency workers has not yet been achieved and workers still report tensions between them as a result. Matthew Dore-Weeks, an American organiser recruited by Unite to cover the region that includes the Flixton site, confirms however that conditions have improved but the key, he believes, has been the renewed strength of the union there. Migrant and local workers found their own ways of tackling problems, including their own red card system in which they would silently and collectively pull cards saying “No to bullying” out of their pockets if any manager started shouting abuse at anyone. M&S technical director Paul Willgoss said: “There is no silver bullet, and this is only the start of quite a long journey, but we are looking for ways to deal with the issues around our labour and sustainability.” For him, his brand cannot afford not to act, but the unexpected bonus has been a dramatic improvement in the quality of M&S chicken coming from Flixton. “And that’s a very big number, believe me”. The new industry phrase for this approach is moving on from “lean manufacturing” to “people-centric lean manufacturing”. It may strike others as reinventing the wheel to discover that treating workers decently actually pays.